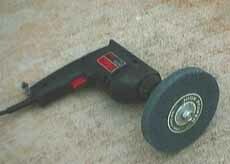 This is an inexpensive way to shorten the shifter throw. I shortened my shifter by about 1/2 inch by installing a Sparco Aluminum Racing Shift Knob, modifying the shifter's mounting sleeve and grinding about 1/4 inch off the shifter shaft. The aluminum shifter lets you feel the shifts more than the stock, leather covered and lead-weighted knob. I also like the shorter shift throw. I got the polished aluminum Sparco knob from my local Sparco distributor, Mid-Atlantic Trading (Rick Valnoski), (609) 758-9800. Rick carries the full line of Sparco racing equipment. The shift knob's shaft hole is as deep as it possibly can so it will mount lower than the stock knob. 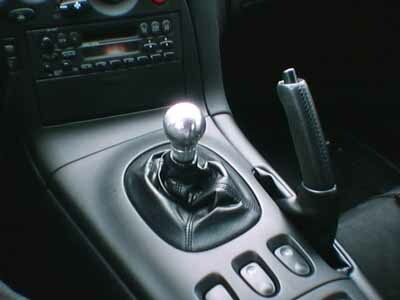 The stock shift knob comes off simply by unscrewing it (turn it counterclockwise), there is no lock screw to hold it on. 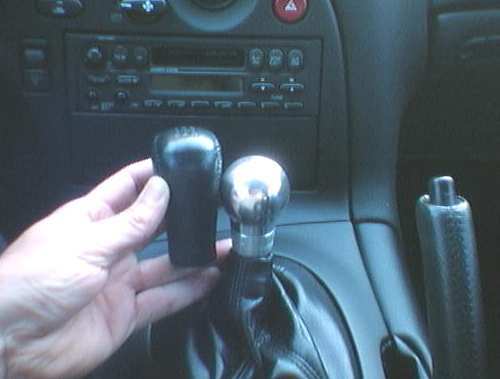 Most after-market shift knobs come with plastic sleeves that adapt the hole in the shift knob to the shaft size. You want to use the adapter that fits snugly and will screw down onto the shaft. You then want to cut off the "cap" of the sleeve so you can screw the adapter down lower onto the shifter shaft. This will allow the shift knob to go on deeper to the point that the shaft end hits the end of the knob hole. This mod alone will lower the Sparco shift knob more than 1/4 inch lower than stock. I wanted to go a little lower so I mounted a 5 1/2-inch course grinding wheel on an electric drill and ground off about 1/4 inch of the shifter shaft. It only took a couple of minutes to grind it down. I cleaned up the beginning of the shaft threads with a small file so I could still re-mount the stock shift knob if I wanted to. The bottom of the Sparco shift knob sits at the shifter boot and looks great. I'm very happy with the way the shifter works, feels and looks.